Samsung claims its new memory 2.7 times faster than the most common embedded memory for high-end smartphones today. 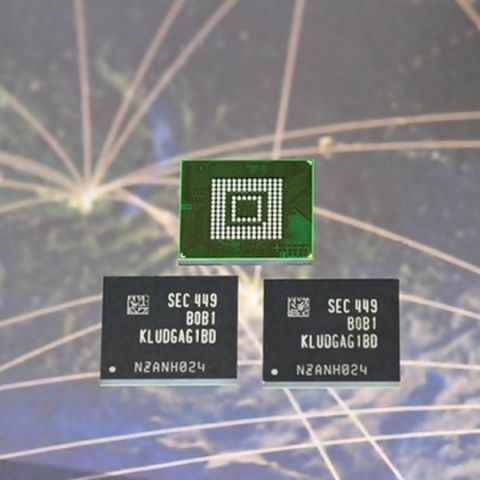 Samsung has confirmed mass production of 128GB ultra fast embedded memory based on Universal Flash Storage (UFS) 2.0 standard for next gen flagship phones. Samsung expects UFS will support high end phones, while eMMC will continue to run on mid-range and budget devices. UFS comes with a technology called “Command Queue” that accelerates the speed of command execution in SSDs thorough a serial interface, boosting data processing speeds compared to the 8-bit parallel-interface-based eMMC standard. "With our mass production of ultra-fast UFS memory of the industry's highest capacity, we are making a significant contribution to enable a more advanced mobile experience for consumers. In the future, we will increase the proportion of high-capacity memory solutions, in leading the continued growth of the premium memory market," adds Jee-ho Baek, senior vice president of memory marketing at Samsung. Samsung's new memory will be available in 128GB, 64GB and 32GB versions, which is said to be two-fold the capacity of its current eMMC line-up. Samsung hasn't confirmed which future phones will come with the new memory. But, speculations are rife the company bring the tech to its much-awaited Samsung Galaxy S6 smartphone, which is scheduled to be unveiled on March 1. Samsung uses its own chip in thier smartphones, is it the disadvantage for Samsung ? difference between xenon flash,LED flash and Dual-LED flash? what is difference between xenon flash,LED flash and Dual-LED flash? WHICH PROCESSOR IS BEST FOR SMARTPHONES ?